We’re used to looking at drama, factual or formats. But why not go a level deeper? Fantasy dramas, historical adventures and even sci-fi comedies (like Dirk Gently’s Holistic Detective Agency, top photo) are booming in the US right now. Parrot Analytics analysed audience demand for television subgenres exclusively for MIPBlog, in this, the latest in a series of global focus posts. In 2017, television content platform fragmentation intensified more than ever. Streaming leaders Netflix and Amazon had content budgets in the billions, several niche SVOD services emerged, and even social network Facebook entered the content arena with Facebook Watch. Meanwhile, linear TV has continued to provide some of the most popular content in the United States. With more content available to watch than ever before, how has content consumption changed in 2017? Parrot Analytics evaluated the content categories that were most in-demand, in comparison to the year prior. By averaging all television subgenres (or the specific types of television genres) for 2017 among the top 20% of demand driven for the year, the most popular subgenres viewers engaged with were revealed. The same exercise was done with 2016 for additional context. It turns out the top television subgenre ranking is actually quite similar to last year: Apocalyptic Dramas topped the charts once again in 2017. Although the huge following The Walking Dead amassed over the past eight seasons is largely responsible, fan engagement with the show’s spin-off Fear the Walking Dead along with TNT’s The Last Ship cemented the subgenre’s leading spot. Historical Adventures were also once again very popular, climbing one spot over last year, considering the growing engagement fans have with titles such as The History Channel’s Vikings and Starz’s Black Sails. 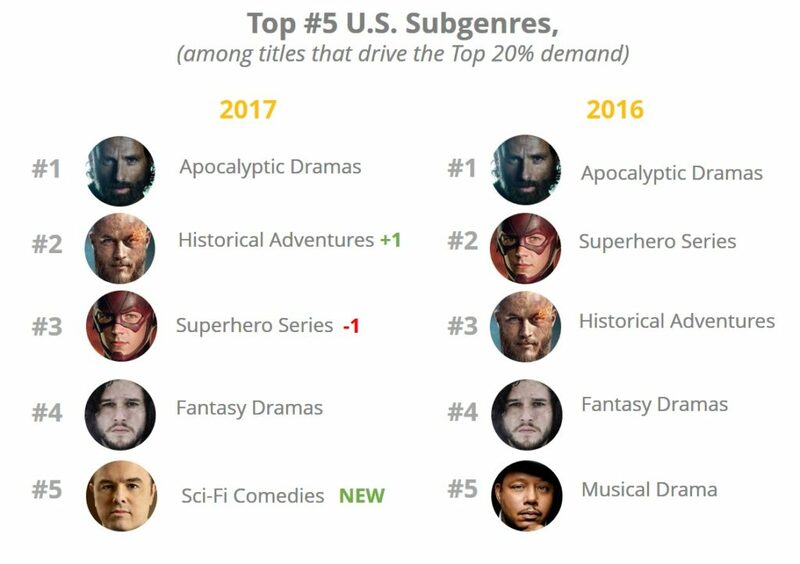 Superhero Series dipped one spot, likely due to the increasing number of titles within the subgenre on both linear and SVOD platforms. The Marvel universe alone had several series premiere over the past two years on Fox, ABC, FX, Netflix and Hulu. Fantasy Dramas, powered by mega-hit Game of Thrones, also have a larger number of titles within the category. While the larger size dilutes the overall subgenre’s demand, it’s also a reflection of the popularity of these types of titles for the past two years—especially since it doesn’t prevent the categories from penetrating the top five list. The biggest change in the 2017 television subgenre ranking is the appearance of Sci-Fi Comedies, replacing Musical Dramas (Empire, Nashville) for the 5th spot. The subgenre’s emergence in the ranking doesn’t indicate the decrease in popularity of Musical Dramas—it was comparable year over year and took the 6th spot in 2017. Instead, the popularity of Sci-Fi Comedies has increased substantially considering the category didn’t even appear within the top 10 at all in 2016. 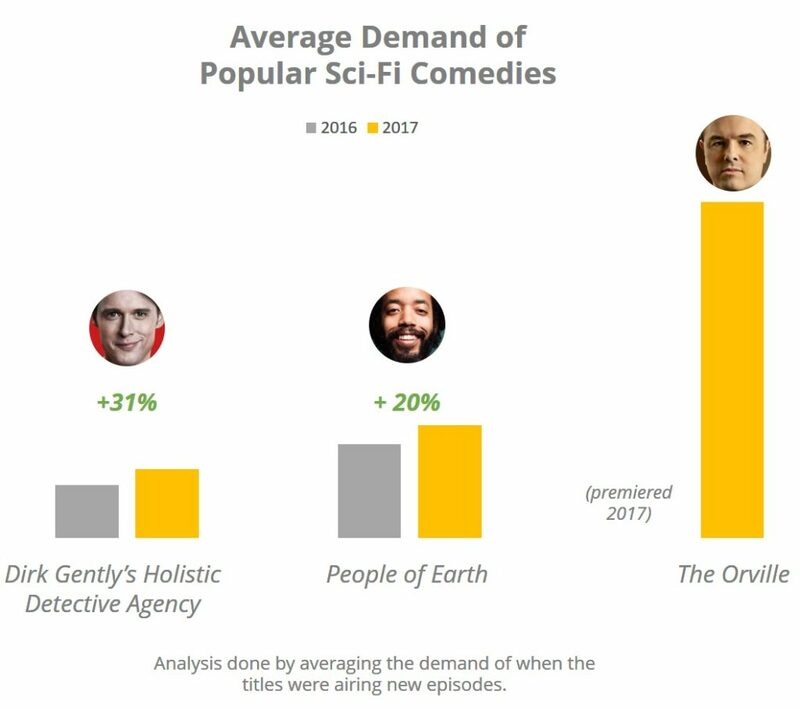 TBS’s People of Earth, and BBC America’s Dirk Gently’s Holistic Detective Agency both premiered towards the end of last year and demand increased for each title in 2017 for their sophomore seasons. Solidifying the subgenre’s popularity was the recent premiere of Fox’s hit The Orville in September 2017, helping the category surface among the top ranks. One reason Sci-Fi Comedies could be resonating with viewers in 2017 might be the increased appetite for science fiction content in general. Over the past two years, Netflix’s Stranger Things dominated pop-culture, drawing a huge fan base for the series. Just recently in October, CBS premiered Star Trek: Discovery enticing Trekkies and those new to the franchise alike, driving both series to be among the most popular titles of the year. While there are more places than ever to consume content and the options seemingly increase every day, it’s more important than ever to view content popularity through a platform-agnostic lens to get a true view of what’s popular, whether linear or SVOD. The year over year subgenre ranking illustrates that the types of content viewers are most interested in is not affected as much by where the content resides, but perhaps much more by the popular culture trends. What will also likely continue to change as the television landscape evolves is an audience’s expectation to find the types of content they want to watch on every platform they subscribe to. 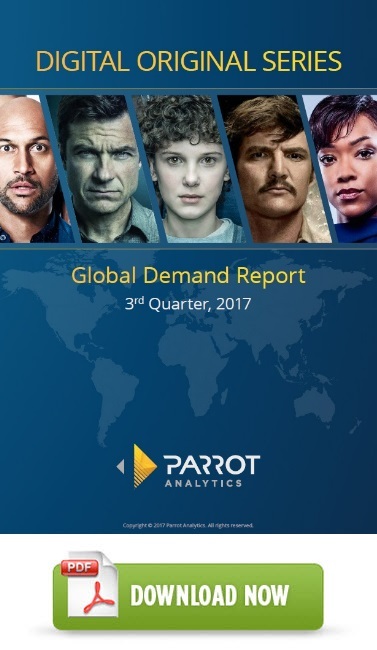 MIPTrends is excited to be sharing Parrot Analytics’ latest in-depth global research report with you: The 3rd Quarter 2017 Digital Originals streaming report provides a comprehensive overview of SVOD content demand trends in 10 global markets. Parrot Analytics reveal the top digital original shows in each country and take a look at the demand trends for a selection of titles in each market over the quarter. Download the report now and discover the top SVOD titles in Q3 for Argentina, Australia, Brazil, Canada, France, Germany, Singapore, Sweden, United Kingdom and United States. Karina R. Dixon is a media research professional with a decade of experience across both quantitative & qualitative consumer media usage and behaviour analysis. She’s engaged as Senior Industry Analyst with Parrot Analytics, an LA-based data science company empowering media and entertainment businesses, brands and agencies with global cross-platform audience demand data for television content.